The most fun in the whole wide world is when all the things I love the most converge. Just before Christmas I began thinking about what my sweet, soon-to-be-six year old would want to do for a birthday party. 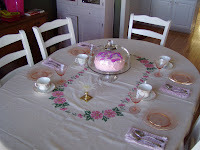 A Princess Tea Party! I presented the idea to her and with big eyes and more ideas than we knew what to do with, we set out together to make a great time for her and 3 other Kindergarten friends. 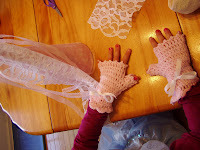 I made these little fingerless gloves for the girls, they made princess hats with jewels and froo-froo to glue on, we “did” their nails, fingers AND toes, they drank tea and lemonade, ate cucumber sandwiches, carrots, almonds, and lots of cake and ice cream. And all this dressed in their princess finery! I think though, that I had the best time of all, watching them and being a part of the frilly, girly time. I have been melancholy lately about how fast time is flying, that I no longer have wee ones, that my last child is now 6 years old. But I’m concentrating on being in the present, in the moment (not in the past) and inhabiting all that six (ten, and thirteen) years old has for me and for them. It’s wonderful to be a part of it, to contribute creatively to it, and to drink in all the memories.